The InDesigner » Blog Archive » The Book is Done! As many of you know from the podcast, I’ve got a passion for styles that’s finally seen a comprehensive outlet in this book. Below is the final table of contents for the book, so you can see what’s included between its covers, as well as in two bonus chapters that you can download for free when you register your copy of the book on the Peachpit web site (it doesn’t matter where you actually bought the book). I wrote way too much to fit in its 256 pages, but the material that got pulled from print will still see the light of day as downloadable content. As more information becomes available about any discount offers or codes that can be used, I will post that information on the blog and include it in future podcast episodes. Speaking of the podcast, this book (even more so than the baby) is what’s kept me from posting any new episodes, as noted in a prior post. Now that it’s finished, expect to start seeing new podcast episodes very soon. I’ve missed doing them–as well as the interaction they give me with the audience–and video will be a refreshing change from writing after six months. Stay tuned! Wow, this looks very impressive. Congratulations! I am looking forward for more InDesigner Video Podcasts! And by the way: Thanks for the wunderful previous episodes. Congratulations & looking forward to the new podcast. Congratulations from Austria! I’m looking forward to hold this book in my hands! Great! Thank you, Michael, I’ve been wanting something a little more comprehensive that I could just pick up and thumb through. Up until now, your podcast was about the easiest thing to reference, and referencing a podcast is a little hard to do. Can’t wait to get the book, and I look forward to new episodes of the InDesigner. Great news, and congratulations, Michael! I’m looking forward to the book, and to you getting back to a more regular videocast schedule! Michael, Congrats on the book – I know what a lot of work it is doing such a project. Perhaps the first new podcast could be a look at how best to use the features discussed in your book. Give your audience a teaser but everyone should be buying a copy to thank you for all the free stuff you have graciously covered over the years. Cool, really looking forward to this one, pre-ordered this morning! Good Stuff… I pre-ordered it weeks ago. I look forward to checking it out! Congratulations on the Baby & Book. Just preordered it from Amazon and looking forward to it. Thank you! Great news on your book. Any chance you would consider publishing it in pdf format as well? Your excellent podcasts demonstrate the value of having the instructions up on screen at the same time as trying out a new technique. I know that the book is available in Peachpit’s online format on Safari Books, but it requires an account to access it. You can get a free trial account on that site to check it out. I will find out what the other digital options are and add a post to the blog (and mention it in my next podcast) when I have more info. I just received your book today(pre-order on amazon). It is beautiful! Hope you find it as useful as it is good-looking. That’s all the design team at Peachpit Press. They did a great job with the layout and cover. I received your book a couple of days ago and it is already marked up throughout, with stars on many entries in the TOC. Thank you for a valuable tool — filled with MANY useful tips on good work practices. I thought I was pretty good at styles, but Michael showed me — clearly! — how to use styles even more efficiently and easily. The first thing I did after finishing the book was to create several Adaptable Styles for all my documents and then create a few GREP styles that will make my work fun again. Congratulations on a superb book. I’m sure to wear out my copy. Congratulations – we’d love to review it too. My copy arrived today… Looks good. My copy should arrive tomorrow. Can’t wait! Hi, Michael – fine to have you back! I got your book a few days ago and started to work my InDesign-knowledge over. Thanks for all that great stuff you arranged to show to us designers. What I’d like to know from the book: what fonts did you use in the project? Great book! Loving the chapter on styling with GREP. Just, bought yiur book, waitig for 10 days was worth it. And keep on going with your very usefull site. I now se why it is important that a whole book be dedicated to styles alone they can be quite cumbersome if one does not possess the right expertise. i intend to get it asap. my question is, i tried applying a nested style within a [paragraph style and it didn’t work, i needed the paragraph with the style to be in one colour, (black) and the paragraph with the nested style another (yellow) and when i clicked ok, the colours were swopped btw both paragraphs. what, pray tell, did i do wrong. 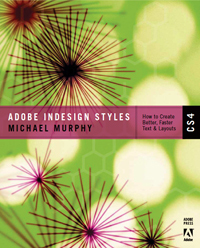 This is an excellent book for teaching InDesign good practices. It is well organized, thorough, and has a useful index. It is also very attractively put together. Thanks for a great resource. I bought the book in Dublin, Ireland. Great read. Up to the standard viewers of the podcast would expect. Informative, Instructive, Insightful, InDeed.